On the feast of Saint Jean Vianney, 2010, EWTN interviewed Father Richard Kunst about his papal artifacts, reputed to be the largest collection outside the Vatican. Since that time, because he has added so many new items, it has grown even larger and contains even rarer items. 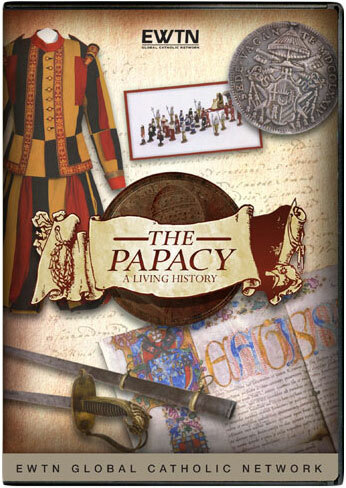 Happy Anniversary, Papal Artifacts! And congratulations to our Curator! The gift of his life to our Church and to all of you who are blessed to share in these artifacts are just a small part of the life of Father Richard Kunst. Like St. Jean Vianney, he is a parish priest with a school to whom he devotes the majority of his life. As a guide on pilgrimages to Rome and various other holy places, including the Holy Land, Ireland, Fatima, Lourdes, Assisi, etc., he is known for his expertise and the level of fun he can add to anything. This is a gifted man whom we thank and honor today on his feast day. Watch the EWTN Live interview with Father Richard Kunst which aired on Wednesday, August 4, 2010. In August of 2010 the Catholic television network EWTN did a live interview with me about my Collection. It has always appeared on the Home Page. The show was very well received. Within a 36 hour period of the presentation, the web site received over 135 thousand hits from all over the world. There are now over thirty pages on the internet connected to Papal Artifacts.com. In May, 2012, a crew from EWTN arrived in Duluth, Minnesota to tape a five-part series on my Collection. I hosted my own show this time with help from a brother priest from my diocese. I was very excited to share this Collection with a wider audience. Hopefully you will be able to view every episode. I have always had a purpose in collecting these artifacts: to educate the faithful about both the structure of the Catholic Church and the popes specifically. When we call the pope the Vicar of Christ, what we are saying is that he is the voice of Christ on earth; that is what vicar means. It has always been my hope and desire that my passion for the popes will lead others to the same love for and interest in our Holy Fathers, from Peter to Benedict XVI. On the feast of St. Jean Vianney, patron saint of parish priests, Papal Artifacts extends a special note of gratitude to all those priests serving in parishes all over the world. The DVD of this series may be purchased from EWTN.